My family is competitive. My children play sports (my husband and I did too when we were growing up), we participate in fantasy sports leagues, we enjoy playing all kinds of games together (board, card, video…), and we all love a good challenge. What better way to have a friendly competition, as well as grow your mind, than a little bit of trivia? I love, love, love trivia games and it seems that my kids have taken after their mom a bit because they like them too. 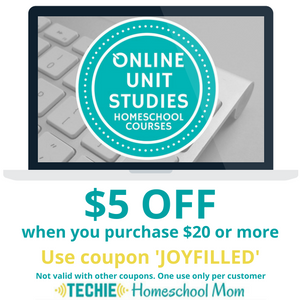 Which is wonderful for this homeschool mom because I can make learning and reviewing info fun by turning it into a trivia game. So, a few years ago I decided to make a Jeopardy-style game board that we would be able to use with any subject we needed work on or wanted to be quizzed on. Having the game board just makes it seem much more ‘official’ and much more fun instead of just reading questions out of a book or off of a flashcard. And this is what I came up with; read on to see how you can make your own…..
Print out the game templates (go to the end of the post to find out how). 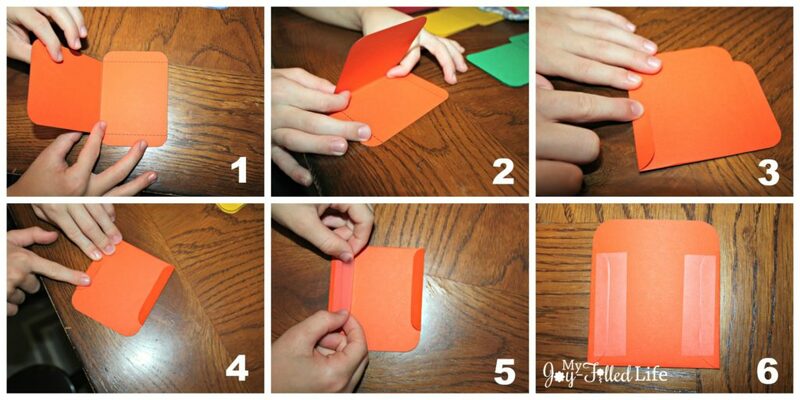 Print 5 pockets on 5 different colors of card stock, for a total of 25 pockets. You will need 5 of the small rectangles; 1 of each color from the colors you used for the pockets. Fold the pockets on the dotted lines and middle fold line and secure with tape on the back as seen in the images below. 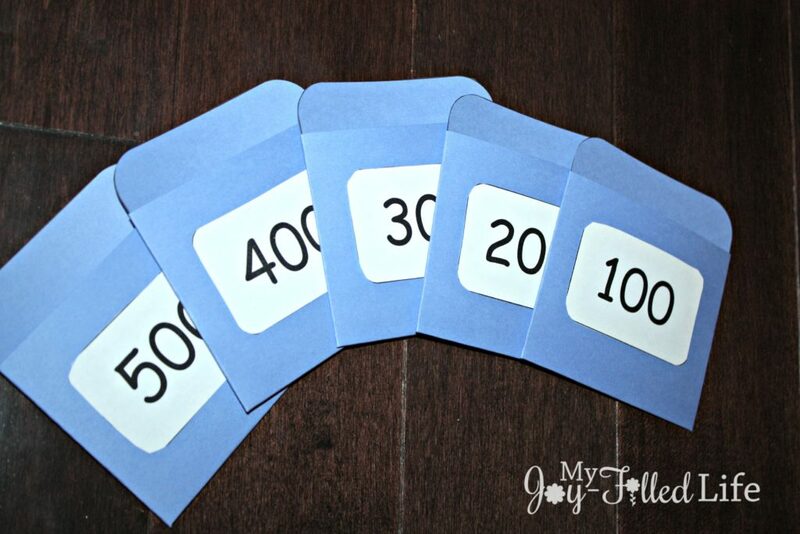 Print out point value cards onto white card stock or white paper; cut out. Then glue (with a glue stick) or tape (with double-sided tape) onto the front of the pockets. 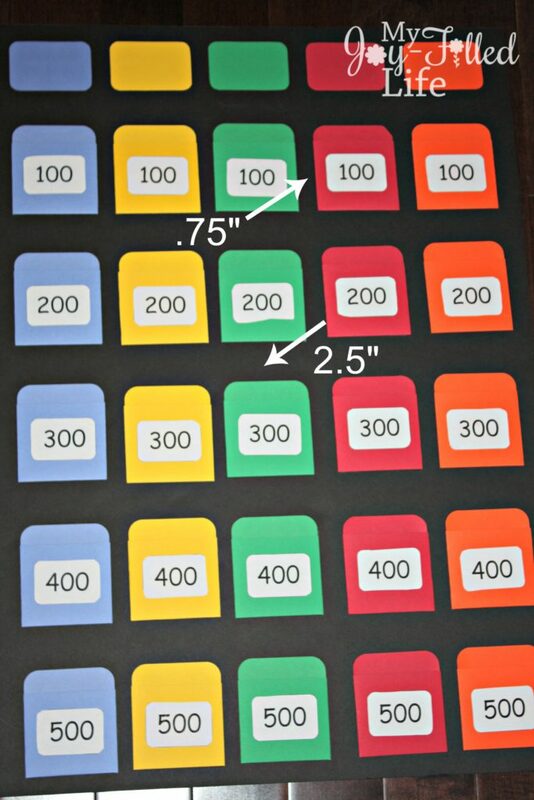 Tape (or glue) one of each number value to each color pocket. I’ve included point value cards for single and double jeopardy and a page of blanks ones in case you want to make up your own point values. 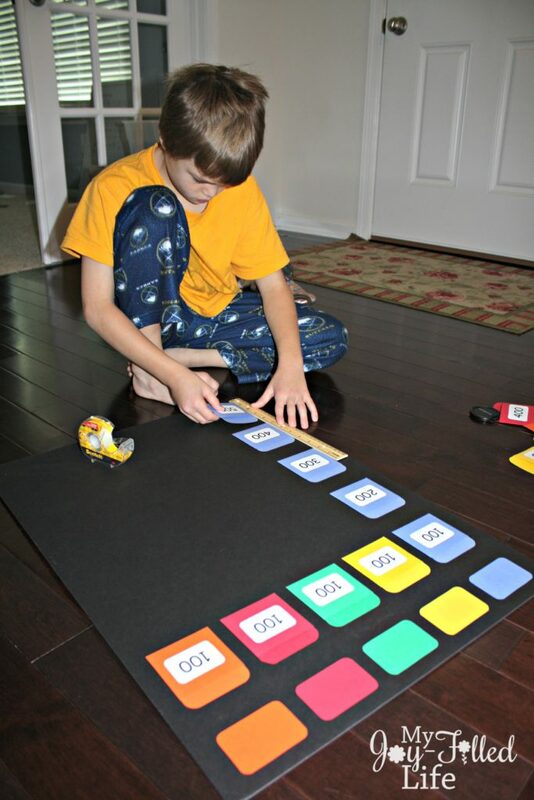 Assemble the game board by taping (with double-sided tape) or gluing the category cards to the top of the foam board. Then tape or glue the pockets below the corresponding color as seen in the image below. The space between each pocket horizontally is 0.75″, the space between each pocket vertically is 2.5″, and the space around the outside of the entire board is 0.75″. These measurements will only be appropriate if you use the same size board as I did; if you use a different size board, just space out the pieces evenly on your board. 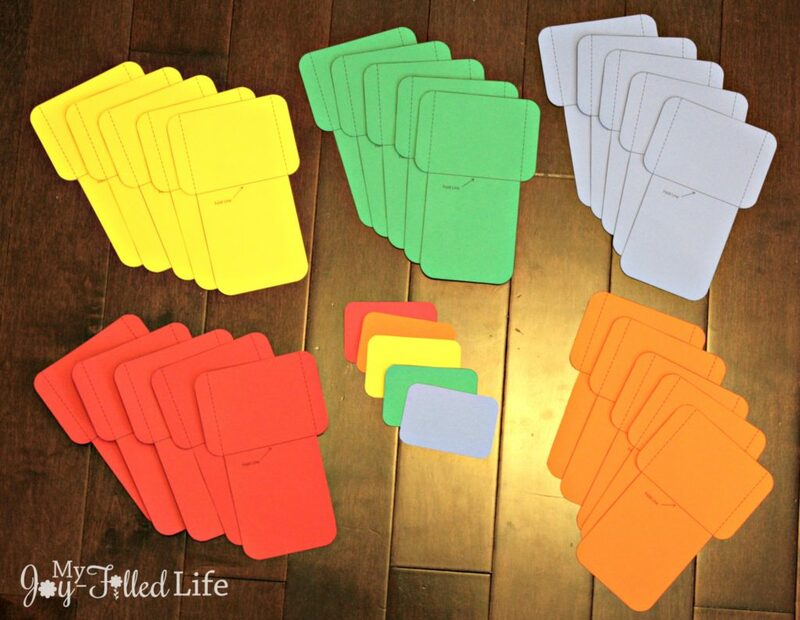 Print out the category cards on white card stock and write your categories on the cards. Laminate, if desired, and then cut out. Or you can print out, laminate and then write your categories on with a dry or wet erase marker (I like wet erase because it doesn’t smudge). Affix a Velcro dot (the fuzzy half) on the back of each category card. 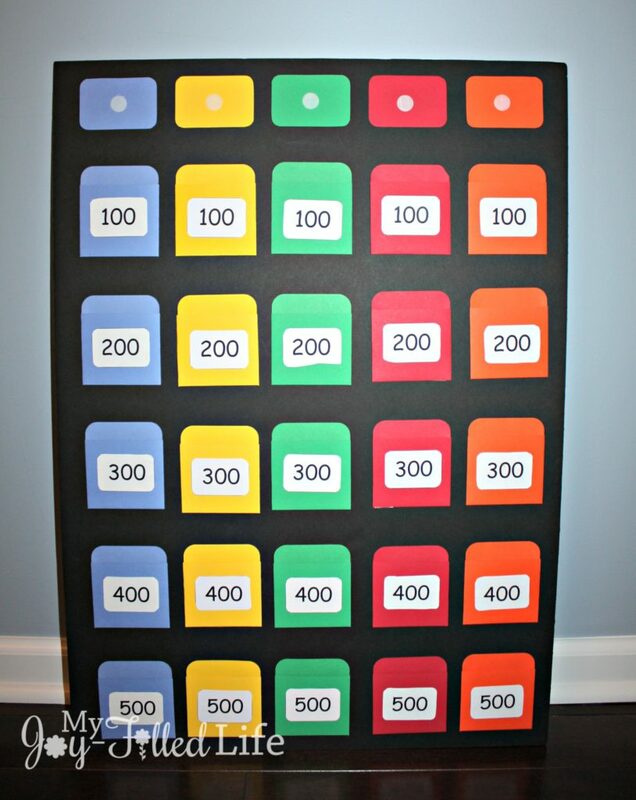 Affix the other half of the Velcro dot to the middle of the colored category cards at the top of the game board. Print out the question cards. You will need 25 of them (or 50 if you are playing double jeopardy). Print out on white card stock, write the question on the front and the answer on the back. Also write the category and point value of the question on the back so you can easily remember which card was chosen and it also makes it easier when setting up the game. Then laminate, if desired, and cut out. You can also just use half of a 3×5 blank index card to write the questions and answers on instead of printing out the question cards. There is a sample question card with the templates so you can see how to write the questions and answers on the cards. When the game is not in use, just store all of the question cards and white category cards (if you didn’t make reusable ones) in a Ziploc bag and label the bag with the game subject – World History, Zoology, The Human Body….). 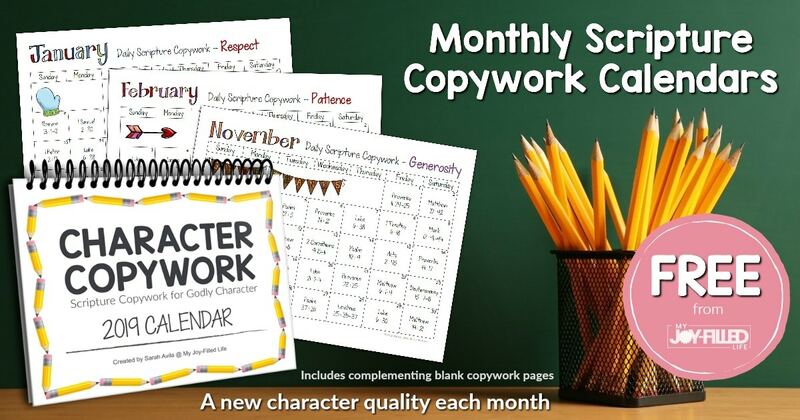 I’m offering these template pages FREE to My Joy-Filled Life subscribers. 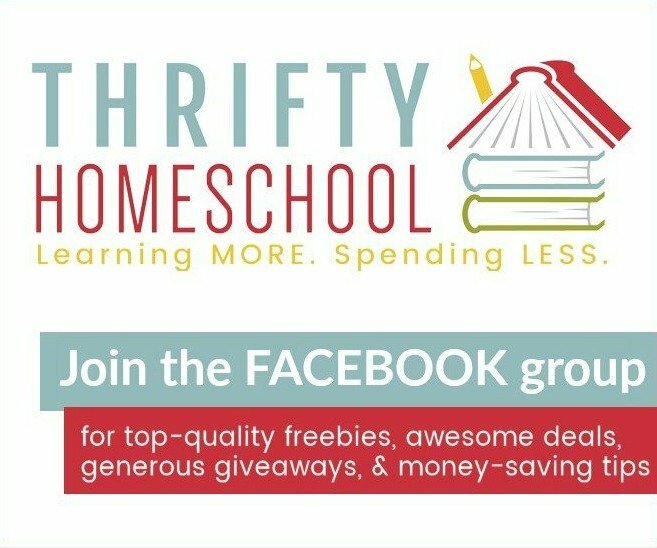 As a subscriber to My Joy-Filled Life you will get weekly(ish) updates and occasional information about great freebies, giveaways, and offers. To download, simply click on the image below and go through the check out process in the store (don’t worry, it’s FREE).